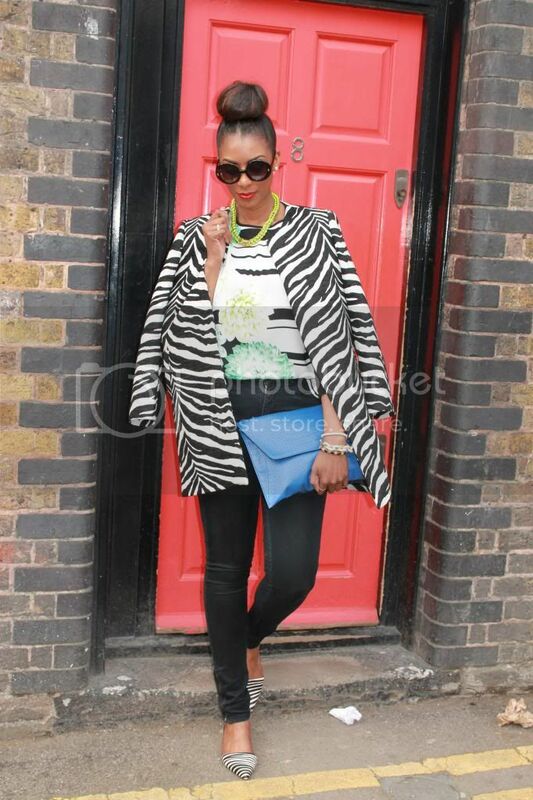 Hi lovelies, this was the first outfit that I wore to London Fashion Week. My sister recently bought me these zebra print shoes from Reiss and although it has been cold outside I have been dying to wear them. You can imagine just how excited I was when I found this striped coat which matched so well, and added with this top (again with black stripes), I think created a great ensemble. Working the same prints together can sometimes be a bit tricky or too matchy matchy...but by blending the same colour combo with the prints positioned in different directions helps pull the look together! How do you like to wear your prints? Did you notice that I also recently changed my header, with an illustration done by my friend Alice. What do you think of it? the lookbook here. What is your favourite piece? i LOVE the pattern mixing here, that coat is just divine! 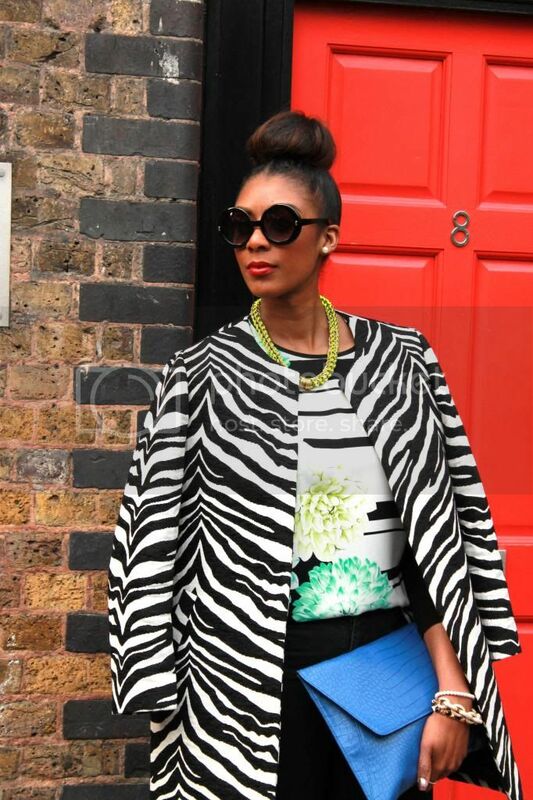 Us tall girls can definitely pull off larger, bolder prints. I love the pops of color you chose and unexpected pattern mixing. I'm a huge fan of your style! I blooming LOVE the shoes Marsha. 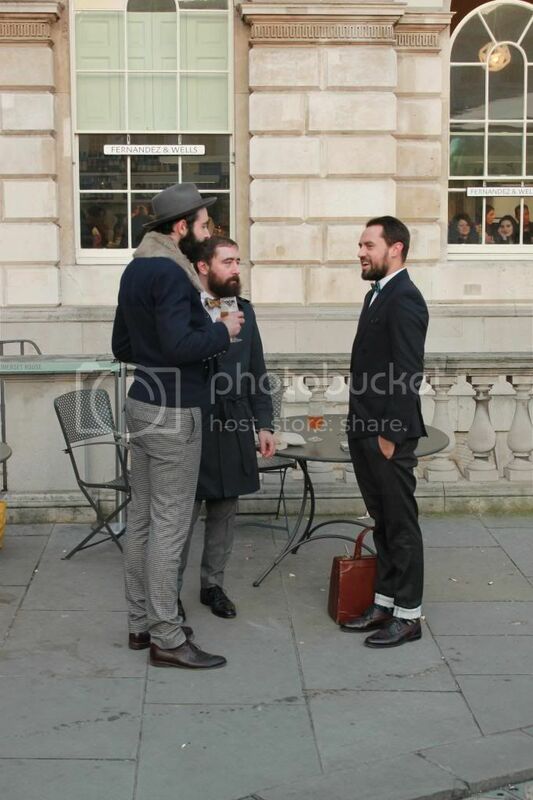 Fabulous outfit and agree with you about the group of men. Perfect match of that coat with your shoes!! OMG you look so pretty! loving the print. Perfect!!! Love the whole outfit!! 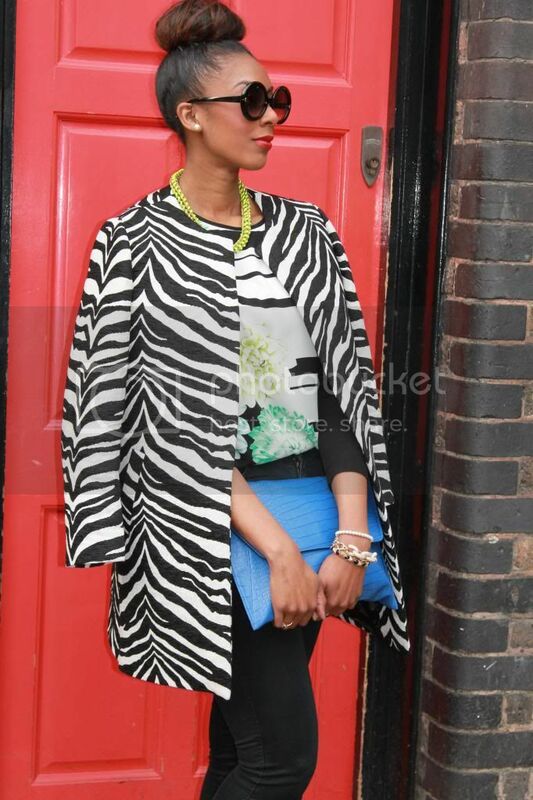 Big fan of animal prints darling and this zebra print is amazing - love it! 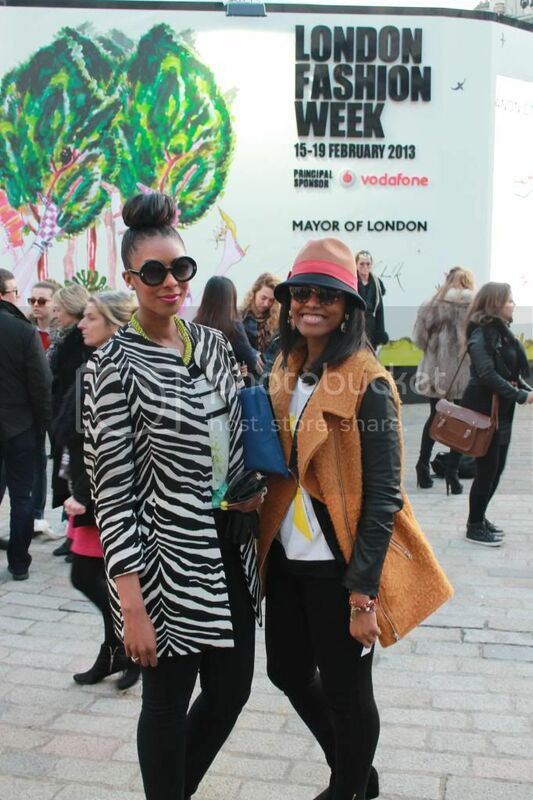 You look so stylish darling as always - hope you had an amazing time at LFW sweetie! Me too especially leopard print! Yes I did thanks! love your outfit! I want the pink version at Zara! Ahhh thanks Nini!!! Always so sweet! I love this look. Esp. 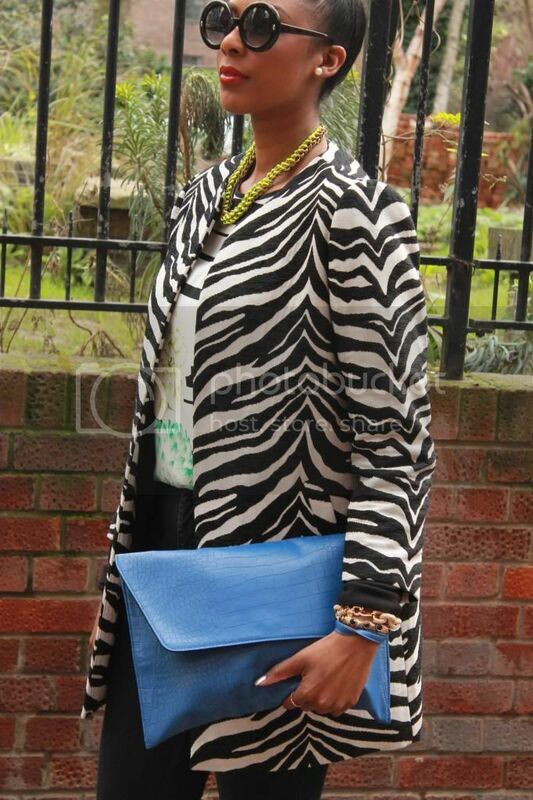 your bun, blazer and clutch! What a gorgeous style, dear!!!!!!!! You look so elegant, classy and stylish! i love the mix of prints and they way you made them go together perfectly! Amazing outfit dear! Love the coat and shoes! Wow love your coat!! So cool! I lived in london and I miss this city so much!! This was a great creation! I live your styles! Killer outfit. I love that blue clutch. I mean that coat is ridiculously awesome, and I love the whole look!!! wow really love your outfit, all the graphic details and your coat is just the best piece ever! Animal Print Compliments Your Out Fit So Well. Stand Out From The Crowd Be Bold, Be Daring, Be Adventurous And Courageous With Dynamic Textures And Fabrics.